Soak the cashews in water over night (or for at least 4 hours). Preheat the oven to 200 degrees Celsius (fan). Wash the potatoes, pierce the skin with a fork a few times and then bake for 60-70 minutes until cooked through. To make the cashew cream, drain the cashews and simply blend all ingredients together, adding the water slowly, until totally smooth. For the guacamole, scoop the flesh out the avocados and mash it with a fork. Finely chop the chilli and coriander then mix into the avocado flesh along with the lime and salt and pepper. When the potatoes are cooked, remove from the oven and cut them in half. Scoop out the middle and mix 2/3 of it into the beans and tomatoes, then scoop spoonfuls back into the potato skins. Drizzle with olive oil and return them to the oven for another 10 minutes. Keep any leftover mixture to eat as a side. 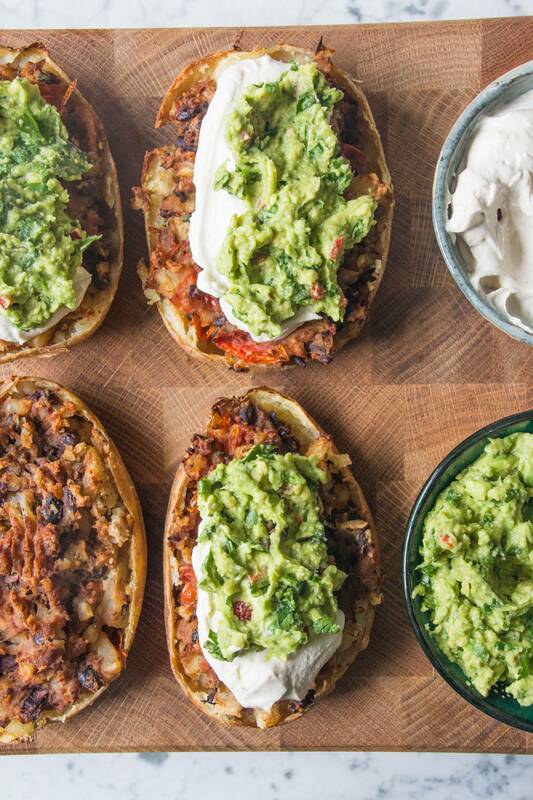 Serve the loaded potato skins with big spoonfuls of cool guacamole and cashew cream on top!